Post subject: What Webcomics do -you- read? Goblins: Life Through Their Eyes - A well-crafted, touching and funny story about, you guessed it, goblins. But, think about it, -why- are they the enemy? In this we get to see the beginings of a band of goblin adventurers. Well drawn and colored. Girl Genius - Self-described as 'Gaslamp Fantasy with Adventure, Romance and Mad Science', this project by Phil and Kaja Foglio (Yes, -that- Phil Foglio) is as intricate and rich a story as the artwork is just plain wonderful. A must-read for steampunk folks (though, I suggest not trying this stuff at home ...). 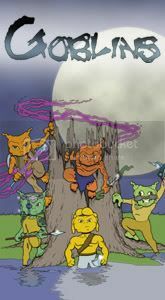 Looking For Group - A fantasy RPG-type setting, probably made even more humorous if you've read the other work by the creators, Least I Could Do. A nice story, often noble, well drawn and colored, and who doesn't like their humor coming from an undead necromancer? and the fourth, mostly about the inner workings of the worlds first corporation for supervillains, is just cool. I guess I am rather boring. I follow a couple of newspaper strips on-line at Comics.com. Primarily the Tarzan strip. I also read Dilbert and For Better or For Worse. I have all the graphics!!!!!!! Does Secret of Mana Theater count as a Web Comic? I used to play this game way back in the day when it was released on the SNES. They turned the story and spiced it up a bit. Good stuff. Years in the making. And thanks Hex for pointing me to Girl Genius. I finished reading the entire thing which was online. Well worth it in my opinion! Brat-halla is a webcomic about the Norse gods from their elementary school days. All-Father Odin and Frigg constantly have their hands full with Thor (the super strong runt of the litter), Loki (the god of mischief who likes to play with dolls), Balder (the invulnerable pretty boy), Hod (the blind god of darkness and winter), Hermod (the hyper super speedster god), and all the rest of the Norse pantheon. Well, I am not surprised that Hex reads Girl Genius. I just wanted to plug Deep Fried here. Deep Fried itself is a crass rude and offensive comic. It's normally well done crass rude and offensive, though, and the Clarissasubstory of a little girl abused by her dad is actually quite moving. One of the recurring characters in the Deep Fried comics has been granted his own story arc, for what looks like 4 issues now (hopefully more). This is Weapon Brown. In a post apocalyptic world, he is a warrior with a cyber arm, alone except for his dog Snoop. The first issue (not on line) shows Chuck fighting Dr. Van Pelt, the agent of the syndicate who used a football to 'condition' him into obeying her; meeting up with his old friend Patty and her new girl, Marcie; stopping Linus from raising the Great Pumpkin; all while on a search for his little redhaired girl. Yes. You got it. It's the Peanuts gang all grown up in a Mad Max world. And Chuck is the biggest and baddest of them all. After that story ended, I guess the fans yelled enough, because Weapon Brown's War started up. Updates normally twice a week, we're into issue three, most of which is on line. Chuck has since fought Beetle Bailey and the Zombies of BC, and is about to go against the Pointy Haired Boss and the King of ID. We're about to see Weapon Brown and Snoop go up against Cal-V1n and H.O.B.S. The first WB comic in Blockhead's War is here. 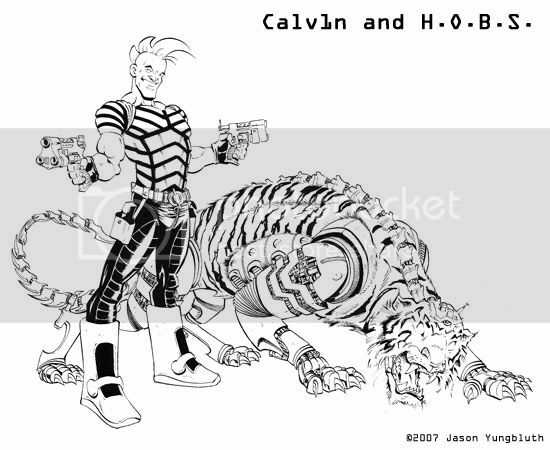 PS: this is CAL-V1n and H.O.B.S. 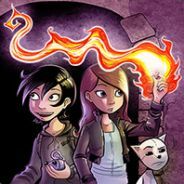 ok, I've been turned on to and recommend highly Gunnerkrigg Court. Young ladies at boarding school with ghosts and monsters and mystery and mayhem and gods and myths and friendship. Mostly different aspects of friendship. school with ghosts and monsters and mystery and mayhem and gods and myths and friendship. Two of my earlier recommendations, Punch an' Pie and Shortpacked, have ceased production. I read David Willis' replacement comic for Shortpacked, http://www.dumbingofage.com/, which features the same characters, in college and with no supernatural/sci-fi elements. I also read Times Like This, a comic about a woman who developed her own time travel device, the uses she puts it to, her friends, and the FBI agent who makes sure she doesn't actually change history.